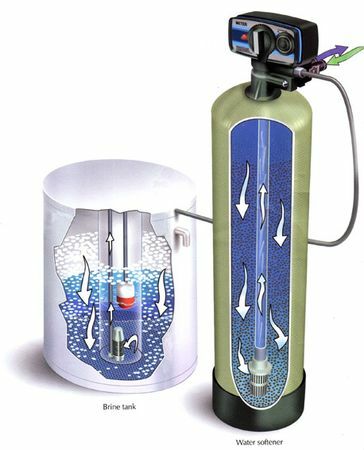 The diagram above shows the two parts of a standard residential water softener. On the left, the brine tank which holds the salt that regenerates the unit, and on the right the water softener itself. A water softener is an ion exchanger. It is not a water filter. Hard water—water with a high calcium/magnesium content—enters the softener through the “In” port indicated by the green arrow. It passes through the control valve and into the main tank, where it goes from top to bottom through a bed of resin that “softens” it. The resin consists of specially manufactured beads that have been saturated with sodium ions. “Softening” occurs as the hardness minerals, the calcium and magnesium ions, in the water attach themselves to the resin and are “exchanged” for sodium, which goes into the water in their place. The softened water then enters the long center tube, called a riser or a "dip tube," via the strainer basket in the bottom of the tank and passes upward through the riser. The water then exits the softener via the control valve (blue arrow) and is sent to the home. When the resin becomes saturated by hardness minerals, it no longer has the ability to soften water. The water softener then automatically goes into regeneration. The regeneration process is initiated by a timer or a meter, depending on the type of softener. More of this below. By this process the hardness minerals are washed down the drain (via a drain tube not shown in the diagram), and the resin bed is rinsed, resettled, and recharged with sodium. It is now again ready to soften water. The regeneration process is accomplished by passing very salty water from the brine tank through the resin. The brine solution is so concentrated that its high sodium content displaces the calcium and and magnesium ions on the resin. The brine tank must remain filled with softener salt at all times so that it can regenerate the softening resin again and again. Regardless of the marketing fluff, softeners fall into two basic categories: timer and meter. A timer-controlled softener, the most basic, works like a clock timer on a kitchen range. You pre-select the day when you want the softener to regenerate and when the day arrives the softener runs its regeneration cycle, usually in the wee hours of the morning. The person who sets up the softener takes an educated guess at the capacity of the softener (how many gallons of water it can treat between regenerations) then another guess at how many days it will take for the inhabitants of the home to use that number of gallons. He then sets the timer accordingly. For example, if it seems that the softener can treat 1000 gallons of water between regenerations and that the family will use about 300 gallons of water per day, the softener might be set to regenerate every third day. That allows a little room for error. With a meter-controlled system, the softener actually counts the gallons of water that are used and regenerates at a pre-programmed gallon mark. For example, the programmer might deduce that the softener has a capacity for 1000 gallons between recharges. He simply sets the softener capacity for 1000 gallons and the softener regenerates the night before the 1000 gallons is expended. If you go out of town for a week and no water is used, the softener does not regenerate. With a timer model, the softener regenerates on its pre-programmed schedule whether water is used or not. Which style is better? Although metered systems have become very sophisticated and are sold as "green" devices that save salt and consequently spare the environment, the reality is that each system has its pros and cons. A metered system does not save salt unless it is set up correctly, and our experience has been that most are not set up very well, even when installed by professionals. Water softeners are commonly referred to with a "size" in grains. A grain is a measurement of hardness. It is the equivalent of 17.1 parts per million. The higher the number of grains,the greater the concentration of calcium and magnesium, the minerals that constitute hardness. The reality is, however, that the regenerated softener does not quite live up to its initial potential, so even if it is fully regenerated the 32,000 grain softener may only have 30,000 grains of capability. It normally takes about 15 pounds of salt to fully regenerate one cubic foot of softener resin. The 32,000 grain softener has exactly one cubic foot of resin. If it is given less salt for regeneration, its softening capacity will be less. For example, if 10 pounds of salt is used rather than 15, the 32,000 grain softener will treat only 25,000 grains of hardness. If 6 pounds of salt is used, the capacity drops to 20,000 grains. Notice the effect, though, of reducing the salt dosage. Although at a 6-pound dosage rate the softener has only 67 percent of the fully-dosed softener's softening capacity, it requires only 40% as much salt. Therefore, in terms of salt consumption, which is a major expense and the most significant figure in determining the softener's harm to the environment, the lower salt dose is more efficient--considerably more efficient. The table below shows performance vs. salt dosage figures for the most common sizes of residential water softeners. Water Usage. It would seem from the chart above that greater economy and less environmental damage will occur if the softener is given a smaller dose of salt and allowed to regenerate more frequently. While it is true that this saves salt, it is equally true that it uses more water. It takes just as much water to regenerate a low salt dose as a heavy one. And regeneration does take some water. Sixty gallons or more is not uncommon, with the exact amount depending on the size and the setup of the softener. Water softeners are often used to remove small amounts of iron from well water, and they're very good at this if conditions are right. (The main condition is that the iron must be in its ferrous state--that is, the water has to be clear when it enters the softener.) If a softener is used to remove iron, it must regenerate more frequently. No more than three days should pass between regenerations if the iron load is significant. What this means is that having a meter-style softener is pointless if you're removing iron. It is much more practical to use a less expensive timer model and simply set it to regenerate every third day. 1. Softener resin can be rejuvenated and re­used. 2 Ion Exchange can consistently remove dissolved Fe/Mn from water to extremely low levels. 3 Softeners have lower backwash water requirements than oxidizing filters. 4 The Fe/Mn removal is not appreciably affected by the water’s pH or other factors. 1. Softening will not operate satisfactorily if iron bacteria or rusty colored water exists, even if only occasionally. If particles are present, a sediment prefilter is often placed before the resin tank. 2. A water softener will not remove hydrogen sulfide odor. the groundwater and subsequently your own well or the wells of your neighbors downhill. Fe/Mn. IE will not work at all where the Fe/Mn have turned to a rusty color. Here's more information, and an excellent water softener to examine.